Fine lines are premature superficial lines that appear on the skin. These fine lines can appear all over the body, but are typically most apparent on the face. Fine lines are a type of static line that appears due to weakened skin structure. The loss of elasticity in the skin and dehydration are main contributors to the appearance of fine lines. The skin is the largest organ in the body, and it functions efficiently due to the synergistic activities of numerous substances, including collagen, elastin, and hyaluronic acid. While collagen and elastin fibres provide strong structural scaffolding in the skin, hyaluronic acid hydrates these fibres for optimal performance. These essential molecules provide the distinctive elasticity and softness of young, radiant skin. However, factors like biological ageing and external skin aggressors (e.g. an improper skincare regimen, smoking, pollution, or unhealthy diet) mar the appearance of the skin, resulting in the formation of lines and folds. Scientists from the University Hospital of Liege in Belgium have broken down wrinkles into 4 different types, which are atrophic crinkling rhytids, permanent elastic creases, dynamic expression lines, and gravitational folds. 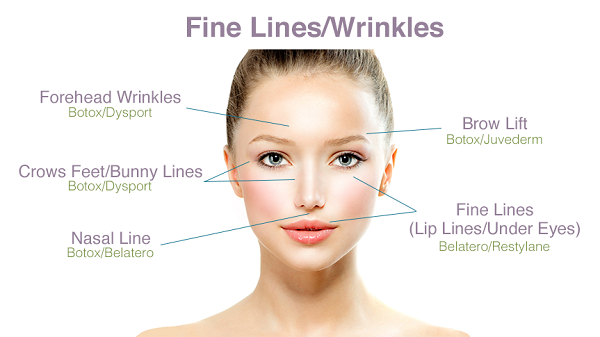 Fine lines are categorized as atrophic crinkling rhytids, as they are caused by the deterioration of the skin structure. Inevitable biological ageing slows down production of new cells as well as the repair of injured cells. Not only that, but important skin maintenance processes like desquamation get interrupted. External skin aggressors introduce harmful free radicals, which further exacerbate skin health. As a result, the skin loses its elasticity and structure. The simplest way to prevent fine lines from forming is by taking care of the skin with a good skincare routine. A nourishing skin regime will delay the premature breakdown of skin structure that is caused by ageing, and will also help protect the skin from free radicals that are introduced through external factors such as sun exposure and pollution. Keeping the skin moisturized is also integral to reducing the appearance of fine lines, since well-hydrated skin does not crinkle as easily as dry skin. Patients can also opt for laser treatment or chemical peels to polish the skin’s outer surface. However, these procedures do not volumise or correct fine lines, but merely decreases their appearance. Patients who are looking for a more pronounced treatment can look to mesotherapy for assistance with fine lines. This non-surgical cosmetic procedure involves injecting bioactive solutions that are filled with curative and protective ingredients, like hyaluronic acid, multivitamins, natural plant extracts, enzymes, and amino acids, all of which help nourish the skin. These aesthetic solutions will subtly plump and lift fine lines without obvious filling actions, allowing patients to maintain a natural overall appearance. Most importantly, the injected solution revitalises the skin by stimulating cellular functions and promoting new cell growth. As a result, the skin is left looking rejuvenated and healthy while diminishing the appearance of fine lines.